The Washington International Trade Foundation is proud to host the Association of USTR Alumni (AUSTRA). 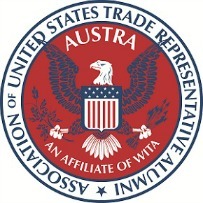 AUSTRA recognizes the contributions and achievements of current and past employees of the Office of the United States Trade Representative and promotes networking among its members. If you would like to be added to our master list of USTR Alumni, please email USTRalumni@wita.org with the subject line USTR Alumni – Add to List, and include your full contact information as well as the years you worked at USTR, and your title(s) during that time. Active USTR employees are welcome but must ‘opt-in’ as mentioned above to be put onto the Master List. If you would like to play an active role in the formation of the Association of USTR Alumni, please email USTRalumni@wita.org with the subject line USTR Alumni – Volunteer and include your full contact information as well as the years you worked at USTR, and your title(s) during that time. Thank you for your service to USTR and our country, and we look forward to working with you to create a vibrant Association of USTR Alumni!